For an extra-festive shopping experience The Royal Exchange is home to an exceptional collection of luxury boutiques in a beautifully decorated, historic London location. And when it comes to finding the perfect present for everyone on your list, look no further. There are iconic watch and jewellery boutiques including Bremont, Omega and Tiffany & Co., stylish leather goods and stationery from Smythson, Sagebrown and Montblanc, luxury scents from Penhaligon’s and Jo Malone London and gourmet delights from Paul A. Young Fine Chocolates – all alongside the newly opened Fortnum & Mason food hall. You’ll have your Christmas gifting wrapped up in no time at all. Celebrate with a glass of champagne or a revitalising cup of tea at the Fortnum’s Bar & Restaurant and soak up the ambience of The Royal Exchange’s magnificent setting, safe in the knowledge your loved ones will discover something sure to delight them under the tree on Christmas morning. 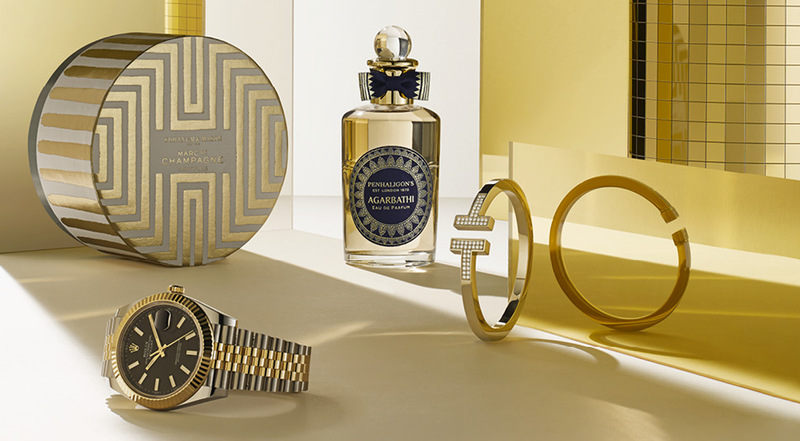 Rolex Datejust 41, £9,350, Rolex at Watches of Switzerland; Marc de Champagne truffle drum, £20 for 250g, Fortnum & Mason; Agarbathi Eau de Parfum, £168 for 100ml, Penhaligon’s; Tiffany T Square bracelet in 18ct gold with pavé diamonds, £10,700, Tiffany & Co.